SEATTLE, WA: Big Trees Inc., (http://bigtreesupply.com/) a tree transplanting and tree nursery company servicing the greater Seattle area, is helping companies go green. The company recently worked with a local Seattle company, making some large additions to the otherwise plain parking lot and grounds. Big Trees installed a large number of Cedar and Sequoia trees, over 40 trees, each measuring over 16’ feet tall, making for a significant addition to the local ambience. The project was undertaken when Big Trees was called in by the company to add more foliage to the grounds. 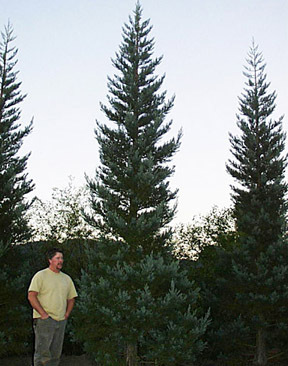 A large number of Alaskan Weeping Cedars and Giant Blue Sequoia trees, each measuring between 16’ and 18’ tall, were brought in. Big Trees planted 24 of both varieties, bringing the project to a total of 48 trees for the new landscape. The trees were placed at a 15’ spacing, allowing for a wide screen around the lot. Each tree was also accompanied by individual drip irrigation to the tree’s root ball to keep the trees watered properly. All aspects of the installation came off successfully, and the company reports the trees are doing very well in their new environment.